Increasingly, in our congested cities, people are using bikes for utility transportation. There are the obvious advantages of saved time and money, the very personal benefit of health and well being, but also the environmental benefit to us all. 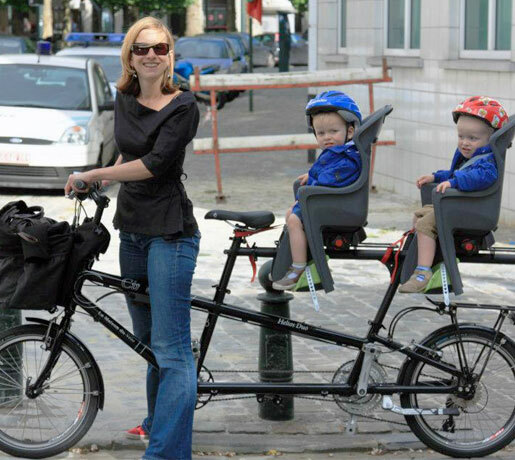 The Helios has proven particularly popular for transporting 1 or 2 children, either in two child seats or, as they get bigger, one cycling and one in a child seat. In the typical city environment where it is used, the Helios offers a light, manoeuvrable and speedy alternative to the traditional heavyweight, sluggish, road hogging child carriers. All that, and a fine tandem in its own right!